Help us Fund our Schoolyard! 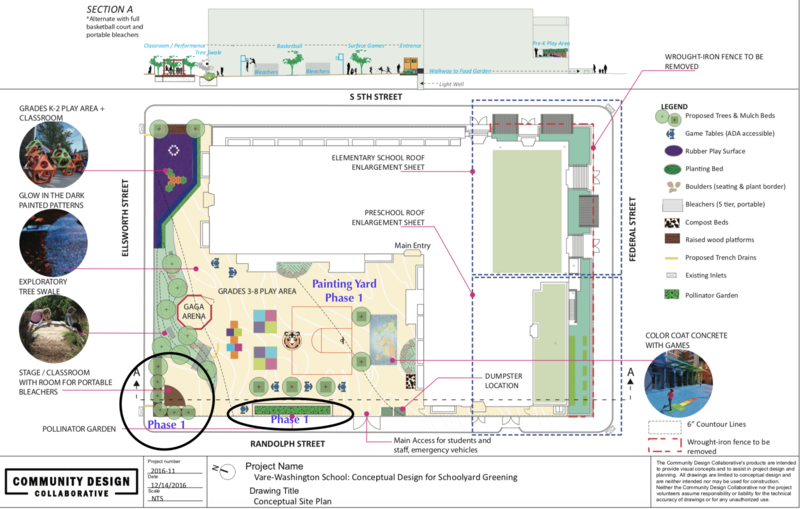 The Friends of Vare-Washington has been awarded a schoolyard design by Community Design Collaborative. Through our partnership with Green Building United we plan to raise the remaining $12,000 as well as bring volunteers together to transform our schoolyard. With the proposed design, the schoolyard will provide a welcoming, fun and safe environment for the students, while creating a green space for the surrounding community. Phase 1 will be a Day of Service lead by community volunteers in June! Depaving part of the concrete to plant trees and creating planter beds. Re-painting the fences and basketball hoop supports. To view our fundraising tiers in detail (budget and plans) please visit our Google doc via the link below. Help us raise the last $12,000! Funds will be used for materials and services. If you would like to volunteer, become a fundraising partner, or donate materials or services, please email heatherelise.school@gmail.com with subject line "VW Schoolyard"